SpaceX’s Dragon spacecraft began its next mission to the International Space Station Friday, with launch aboard a flight-proven Falcon 9 rocket – the final Block 4 vehicle – from the Cape Canaveral Air Force Station. The mission, which will also use a previously-flown Dragon capsule, lifted off at 05:42 Eastern Daylight Time (09:42 UTC). The second Dragon flight of 2018, the CRS-15 mission launched Friday is carrying 2,700 kilograms (5,900) of supplies, provisions and equipment to the space station. Dragon is one of two US cargo vehicles – along with Northrop Grumman’s Cygnus – that perform deliveries to the outpost under NASA’s Commercial Resupply Services (CRS) contracts. Both Dragon and Cygnus were developed under NASA’s Commercial Orbital Transportation Services (COTS) program, aimed at maintaining the agency’s ability to get cargo to the International Space Station following the retirement of the Space Shuttle. The CRS contracts, which cover operational flights, were first awarded in 2008. Dragon consists of a pressurized capsule and an unpressurized trunk section, with the trunk providing critical services such as power generation via its solar arrays, as well as space for externally-mounted cargo. Dragon’s capsule is designed to be recovered at the end of a mission and can be refurbished for subsequent missions, while the trunk burns up on reentry. Other than Russia’s manned Soyuz spacecraft, Dragon is the only spacecraft currently capable of returning cargo to Earth from the space station. SpaceX was originally awarded twelve resupply missions for Dragon, with this being extended to 15 and later 20 in 2015. 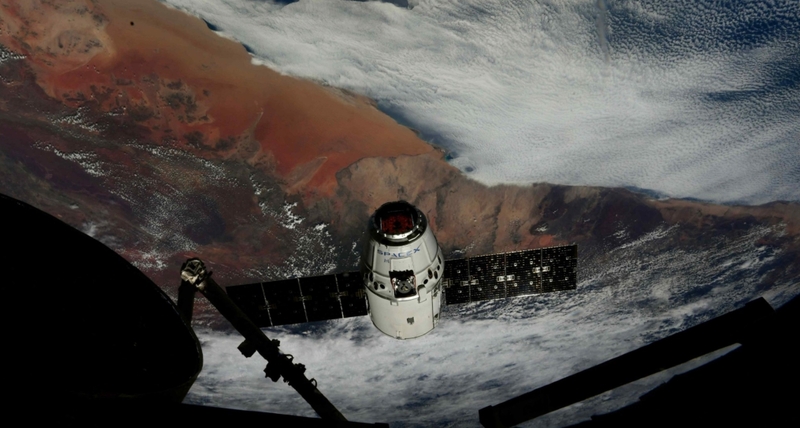 SpaceX has also been awarded a contract under the second phase of Commercial Resupply Services, CRS2, for six cargo missions with its next-generation Dragon 2 spacecraft. Orbital ATK – now Northrop Grumman Innovation Systems – and Sierra Nevada Corporation were also awarded cargo missions for their Cygnus and Dream Chaser spacecraft respectively. Friday’s launch began Dragon’s seventeenth flight, which will use spacecraft C111. This capsule already has one round trip to the ISS under its belt – having performed the CRS-9 mission in 2016. 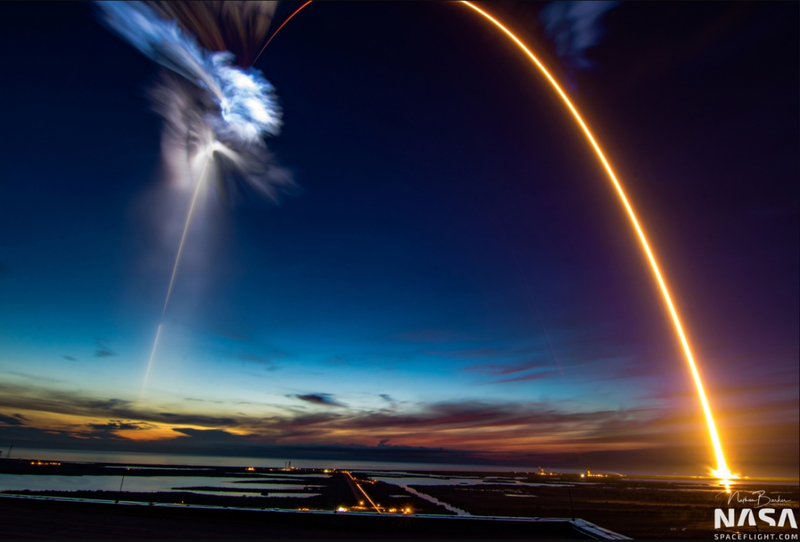 Lifting off from Cape Canaveral in mid-July, CRS-9 saw Dragon spend thirty-six days berthed at the space station’s Harmony module before returning to Earth in late August. CRS-9 ended with the capsule splashing down in the Pacific Ocean off the west coast of Mexico. 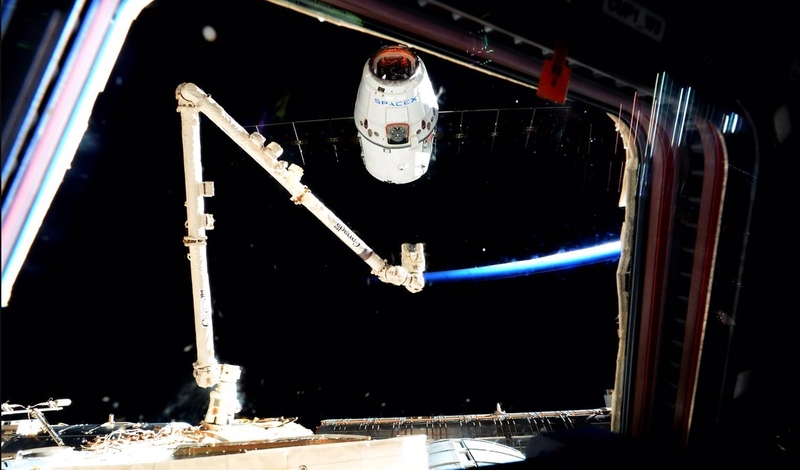 It is the fourth time a previously-flown Dragon spacecraft has been used for a CRS mission. SpaceX intends to use refurbished spacecraft for its remaining Phase 1 CRS contracts, which has allowed the company to cease production in favor of the Dragon 2 vehicle that will support future manned and unmanned missions to the station. The cargo aboard CRS-15 includes 205 kilograms (452 lb) of provisions for the crew, 178 kilograms (392 lb) of hardware for the US orbital segment of the outpost, 12 kilograms (26 lb) of hardware for the Russian part of the station, 21 kilograms (46 lb) of computer equipment and 63 kilograms (139 lb) of hardware to support future spacewalks. There are 1,233 kilograms (2,718 lb) of scientific experiments and equipment aboard Dragon. One experiment is Chemical Gardens. These are inorganic silicon-based structures that form from the interaction of metal salts and silicate anions. The complex structures that grow can resemble plants, and the goal of growing chemical gardens aboard the space station is to see how they develop in microgravity conditions, without the effect of Earth’s gravity. The BCAT-CS experiment will study cohesive and adhesive forces in sediments that are being transported aboard Dragon. These forces can cause particles to cluster together, but as they are much weaker than gravity they are hard to measure in laboratories on Earth. BCAT-CS will study quartz and clay sediments in microgravity, providing experimental results that can be used to validate existing scientific models of the forces. Rodent Research 7 will study the effects of microgravity on microorganisms that live in the gastrointestinal tract, allowing for a better understanding of how to ensure the health of astronauts engaged in long-duration missions and to aid research into related conditions on Earth. Angiex Cancer Therapy will test a new drug that has proven effective against cancer in microgravity conditions, where certain cultures of cells have been shown to exhibit similar properties to those in living organisms. The experiment will validate whether microgravity conditions can be used to model the performance of the drug within an organism, helping to develop new techniques for testing future drugs. The European Space Agency’s Crew Interactive Mobile Companion (CIMON) will employ artificial intelligence (AI) to support astronauts aboard the station. Enclosed within a 3D-printed shell, CIMON will be able to maneuver autonomously, using onboard fans to control its flight in microgravity. The unit will be able to hover at eye level with the astronauts, with a screen displaying its face. CIMON incorporates ultrasonic sensors for collision detection and an array of cameras and microphones that will help it in interactions with the crew and movements around the station. 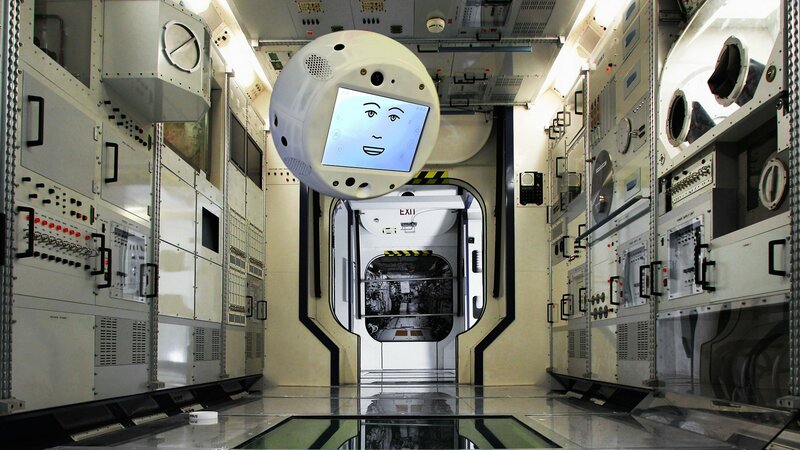 CIMON’s AI is based around IBM’s Watson system, which can run locally aboard the unit or be downlinked for cloud processing when the space station is in range of NASA’s Tracking and Data Relay Satellite System (TDRSS). The mobile companion is designed to interact with the crew, assisting with experiments and operations through a voice interface that allows the astronauts to keep their hands free for other tasks. This will allow them to ask for instructions and run through checklists. CIMON can also be used as a floating camera platform, to provide early warning of problems aboard the station and to monitor the psychological condition of its human crewmates. CIMON’s interactions with the crew are intended to be natural, with the AI able to display emotions and appear to nod when processing its response to a question. Astronaut Alexander Gerst, currently aboard the ISS, contributed to the design of CIMON helping to pick out a face and voice to aid bonding with the crew. Gerst will perform three experiments to test out CIMON during his time aboard the space station, including growing crystals, solving a Rubik’s Cube and a medical experiment. The ESA project – which is led by the German Aerospace Centre (DLR) – is seen as a precursor to the inclusion of AI assistants on future long-duration deep space missions. NASA’s Ecosystem Spaceborne Thermal Radiometer Experiment (ECOSTRESS) is an ecological research payload that will be mounted outside the space station to monitor the temperature of plant life on Earth’s surface. The experiment will help to study how the planet’s ecosystems respond to the amount of water available and the resultant impact on the carbon cycle. ECOSTRESS will also be used to evaluate how monitoring water consumption and forecasting drought conditions can help protect agriculture. ECOSTRESS uses the Prototype HyspIRI Thermal Infrared Radiometer (PHyTIR), a prototype instrument developed as a technology risk reduction exercise for a future mission named HyspIRI. PHyTIR contains a shortwave infrared pushbroom spectrometer and a whiskbroom thermal infrared multispectral imager. Operating in six spectral bands, PHyTIR will provide a resolution of up to 38 meters (125 feet). 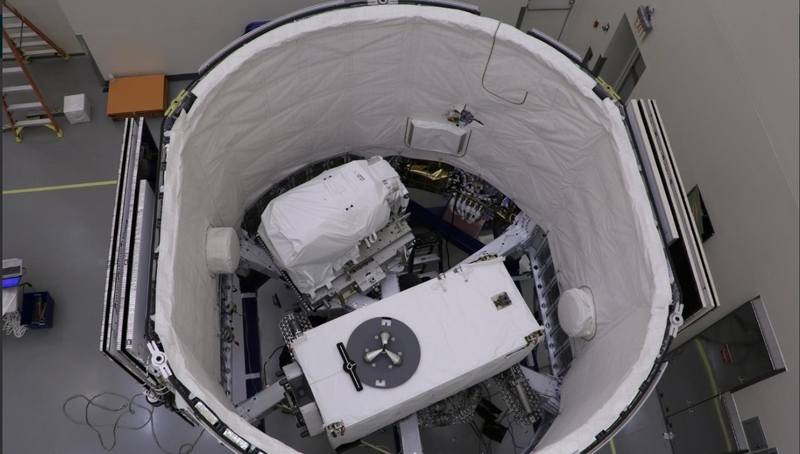 The 490-kilogram (1,080 lb) instrument draws 516 watts of power from the space station and will be mounted on the exposed facility of the Japanese Kibo module. Dragon’s Trunk is also transporting a replacement Latching End Effector (LEE) for the space station’s CanadArm2 robotic arm. The robotic arm has two end effectors, one at each end of the arm, which allow it to move between different base points around the outside of the space station and to grapple other hardware – including Dragon, Cygnus and Kounotori spacecraft. After performance issues related to their age, both LEEs were replaced during spacewalks late last year and early this. The new end effector, which was built as a ground spare, will be stored outside the station ready to be installed if needed. The new LEE inside Dragon’s Trunk. The Latching End Effector that was removed during last October’s spacewalk has been brought aboard the space station. This will be packaged up and returned to Earth within Dragon’s pressurized capsule, allowing it to be refurbished and become the new ground spare. Six CubeSats are aboard Friday’s launch. Carried aboard Dragon as pressurized cargo, these will be released from the space station at a future date. 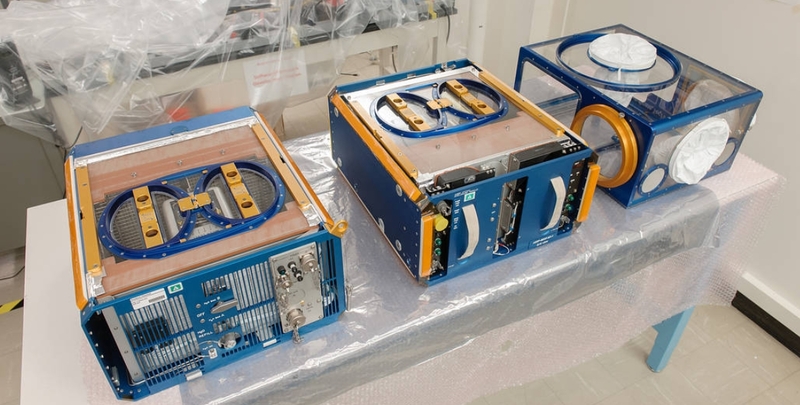 These miniaturized satellites include Biarri-Squad, a constellation of three CubeSats that will be used by the multinational Biarri project to study potential military applications for constellations of small spacecraft. A partnership between the United States, United Kingdom, Australia and Canada, Biarri-Squad uses three-unit CubeSat buses built by Boeing under the US National Reconnaissance Office’s Colony-2 program. Building on the flight of Biarri-Point, a risk-reduction satellite that was deployed from the ISS last May, Biarri-Squad will use L1 GPS receivers and laser ranging to make precise measurements of the satellites’ relative positions. Australia’s Electro-Optic Systems (EOS) will perform the laser ranging experiments – relying upon retroreflectors aboard each CubeSat. The other three CubeSats aboard Dragon for Friday’s launch form part of the Japanese-led multinational Birds-2 project, consisting of small satellites with Earth imaging, radio and technology demonstration payloads. The original Birds constellation, consisting of five satellites, was previously deployed from the International Space Station early last July after launching aboard Dragon’s CRS-11 mission the previous month. Each Bird satellite is a single-unit CubeSat. Built by Japan’s Kyushu Institute of Technology (KIT), in partnership with other universities and organizations around the world, the satellites will return images of the Earth, be used by amateur radio enthusiasts and test new microcontroller systems in orbit. Birds-2 consists of spacecraft built in partnership with universities in Bhutan, the Philippines and Malaysia. The Bhutan-1 CubeSat, also known as Bird BTN, will be the Kingdom of Bhutan’s first satellite. Maya-1, or Bird PHL, was constructed for the University of the Philippines Diliman and will be the first Filipino CubeSat in orbit – although the country has previously operated larger satellites. Malaysia’s contribution is the Universiti Teknologi MARA Sat 1 (UiTMSAT-1) – or Bird MYS – which was built in conjunction with the Shah Alam-based MARA University of Technology. SpaceX launched Dragon on its way to the space station via a Falcon 9 rocket. First flown in June 2010, Falcon 9 is the only rocket currently flying that is – in part – reusable. Falcon 9’s first stage is designed to be able to make a powered landing after boosting the rocket’s second stage and payload on their way towards orbit, allowing the stage to be refurbished and reflown on subsequent missions. The Falcon 9 design has undergone several revisions since the type’s introduction, including the v1.1 and v1.2 configurations that debuted in 2013 and 2015 and incremental block upgrades within each of these configurations. Following the first flight of the Block 5 Falcon 9 v1.2 last month, intended to be the definitive version of the rocket, SpaceX is phasing out their remaining hardware from previous generations. While SpaceX expects the Block 5 first stages to be capable of many flights, earlier versions have been used for a maximum of two launches. The first stage for Friday’s launch is Core 1045.2, a Block 4 first stage that will be making its second and final flight. Core 1045 was previously used in the launch of NASA’s Transiting Exoplanet Survey Satellite (TESS) on 18 April – making its second flight, just seventy-two days later, the fastest turnaround to date for a recovered first stage. Because the first stage cannot be used for any further launches, SpaceX did not attempt to recover it following Friday’s launch. Although SpaceX does have one remaining Block 4 first stage – Core 1042 which was used last October to deploy Koreasat 5A – this is not expected to fly again making the CRS-15 launch the last to use a Block 4 vehicle, or any version of Falcon 9 other than the Block 5. Falcon lifted off from Space Launch Complex 40 (SLC-40) at the Cape Canaveral Air Force Station. This launch pad – which previously supported Titan III and Titan IV rockets – was leased by SpaceX in 2007 and was used for all East Coast Falcon 9 missions until it was damaged in a pre-launch accident in September 2016. 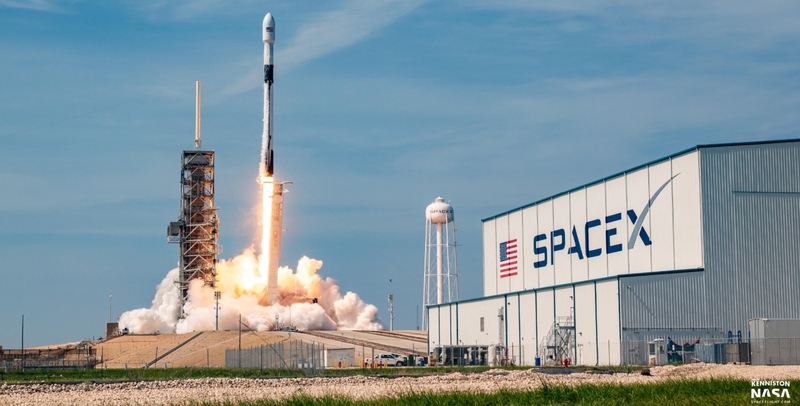 While SLC-40 was repaired, SpaceX performed launches from Launch Complex 39A at the Kennedy Space Center – which had already been undergoing conversion for Falcon 9 at the time of the accident – with SLC-40 returning to service last December. Falcon is assembled horizontally in a hangar close to the launch pad. Once the first and second stages have been integrated the rocket is rolled out for a static fire – giving the first stage engines a short test run to shake down any potential issues with the vehicle. The static fire for Friday’s mission was performed last Saturday, after which Falcon returned to the hangar to allow the Dragon spacecraft to be fitted to the top of the stack. Falcon was rolled back out to the launch pad – this time with Dragon – on Thursday and following the addition of late-load payloads to the Dragon capsule, the rocket was raised to the vertical position. Fuelling of the Falcon 9 takes place in the last seventy minutes of the countdown. Loading of RP-1 propellant – a refined petroleum commonly used in rockets – begins at the T-70-minute mark in the countdown while oxidizer – supercooled liquid oxygen – is pumped into the rocket’s tanks from the thirty-five-minute mark onwards. Friday’s launch sequence began with ignition of the Falcon’s nine Merlin-1D first-stage engines about three seconds ahead of the planned liftoff. The three-second holddown gives the engines enough time to build up to full thrust while the rocket’s onboard computers can verify their performance is nominal and abort the launch if the engines are not healthy. 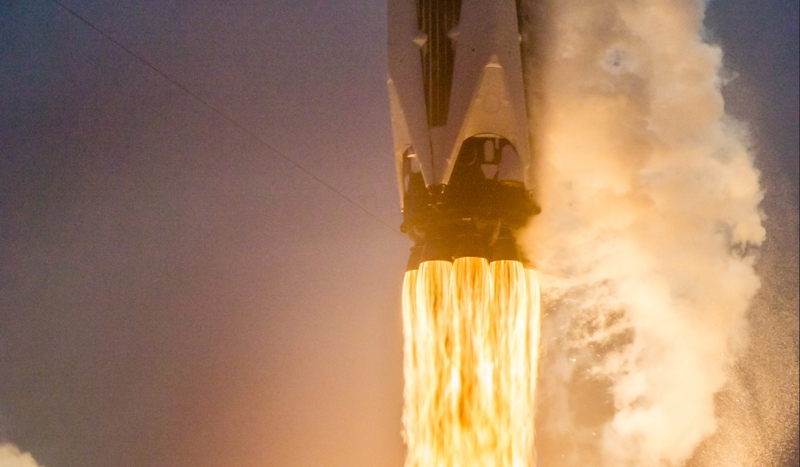 Once Falcon 9 lifted off, the rocket climbed away from SLC-40 before maneuvering to the required trajectory to put Dragon on course for the International Space Station. Heading to the northeast over the Atlantic Ocean, Falcon passed through the area of maximum dynamic pressure – Max-Q – seventy-nine seconds into flight. The first stage, Core 1045.2, powered Falcon’s ascent for the first two minutes and 45 seconds of the mission. Since the core was not going to be recovered, it did not need to save propellant for the entry and landing burns so can burn for longer than on missions with a landing attempt. This reduces the amount of work the second stage has to do to reach orbit. The first stage shutdown event is designated main engine cutoff (MECO). Three seconds later, the spent first stage was jettisoned and allowed to fall back to Earth. Falcon’s second stage ignited its single Merlin Vacuum (MVac) engine eight seconds after stage separation. For Friday’s mission the second stage only needed to make one burn to place Dragon into its planned deployment orbit, with this burn lasting five minutes and 35 seconds. Dragon separated from Falcon 9 one minute after the end of the second stage burn, at nine minutes and 31 seconds mission elapsed time. After separation, Dragon will make a series of burns to set up its rendezvous with the International Space Station. Arrival is expected at around 11:00 UTC on 2 July – when the spacecraft will be grappled by the CanadArm2 robotic arm and berthed at the nadir – Earth-facing – port of the Harmony module. Dragon will remain at the space station for one month before it is unberthed and released to begin the journey back to Earth. Friday’s launch was the fifty-seventh flight of SpaceX’s Falcon 9 rocket and its eleventh mission of 2018. The next Falcon 9 launch is currently slated to be from Vandenberg Air Force Base on 20 July, with a payload of ten Iridium-NEXT communications satellites. Another launch from Cape Canaveral with the Telstar 19V satellite is currently scheduled for the next day. Dragon’s next CRS mission, CRS-16, is targeting a launch in mid-November.